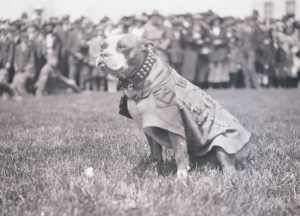 A stray dog who wandered onto New Haven Green in Connecticut as American soldiers were getting ready to ship out to go to France one day during the summer of 1917 ended up saving hundreds of lives on the front lines during World War I.
Stubby, as the dog was known, captured a German soldier and repeatedly warned American soldiers of poison gas attacks, according to the Connecticut Post, quoting from an obituary in The New York Times from 1926. Stubby has his own display at the National Museum of American History. The museum’s web site has an article about him.